When this book was first announced I was honestly surprised that these two very different (yet rooted in science fiction) would be meeting each other. I’m gonna be completely honest in that a small experience when it comes to Planet of The Apes (I’ve seen the original exactly once) so I’m hoping that this series isn’t a exclusive barrier for fans of either side. Who knows maybe this crossover will actually create new fans. Also if you’re wondering I’ll eventually get around to reviewing the Star Trek/Green Lantern review…..maybe. Warning there will be spoilers going forward. You’ve been warned. One thing that caught my eye immediately was that for the first time, we get to see Barnaby Bagneda’s art in full bloom. If you read The Omega Men (don’t feel bad if you didn’t only a handful of people did) then you know that for most of the series Bagneda’s art was stuck to a strict nine panel grid with occasional splash pages to emphasize an emotional moment. In this issue Bagnada’s art is given the space to breathe. It gives him the chance to tell a lot of story with body language and give the reader vibrant locations to look at. Occasionally certain faces look off, but the storytelling remains great and seeing his art again makes me smile. The crux of the story centers around one of the apes, and while I was able to gather enough information as to who is he and what is going on around his world. With how this book is structured, it feels like you should already know who this particular character is and given that Hal Jordan along with the rest of the Green Lantern Corps are given a similar introduction it seems to be that both Robbie Thompson and Justin Jordan want to drop you in the middle of something and you’re expected to pick up vital information as the series progresses. It feels that the first issue was built upon making the readers ask questions as to what exactly is going on. It is a set up issue but it gave me enough intrigue to see exactly what is going to happen in the next issue. Being extremely vague with a plot device will always work with me. Even though I enjoyed the issue for the most part but having just finished a Green Lantern book where a ring that nobody knew existed can channel every aspect of the emotional spectrum, and now I might be seeing something similar here it did hurt my enjoyment. In complete fairness, I’m pretty sure there will be readers of this series who didn’t read the Phantom Lantern story and Thompson and Jordan have something different up their sleeves but it has made me cautious. Also did they have to include the “damn it all to hell line.” as Hal Jordan looked at the iconic destroyed Statue of Liberty? Even if you know nothing about Planet of The Apes, more than likely that’s a reference you’re familiar with. It felt like a huge wink at the camera that removed me from the story you’re currently telling. The panels we’re laid out the exact same way, hopefully this is the only wink at the camera going forward or they’ll be so obscure that I won’t even care. 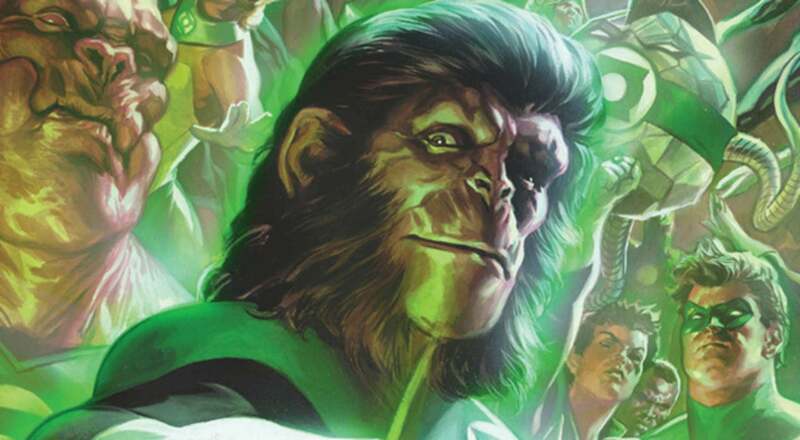 Planet of The Apes/ Green Lantern #1 has the benefit of Barnaby Bagneda on pencils, right now I’m not super into the story but I will be reviewing the rest of the series so hopefully it becomes something interesting and not just a retread of something I just read. Green Lantern® is a registered trademark of DC Comics/Time Warner, © 2019. Copyrighted pictures are ® their respective owners. Contact the webmaster. Web Design by Matthew Fraser.